Prepare your furry little four-legged friend for a shark infested Halloween with one of these outstanding pet shark costume! These costumes are perfect for sharks of all sizes and will have them looking as ferocious as ever. There are also some incredible DIY costume tutorials below that are perfect for the shark owners who want to help their best friend hit the seas this Halloween! 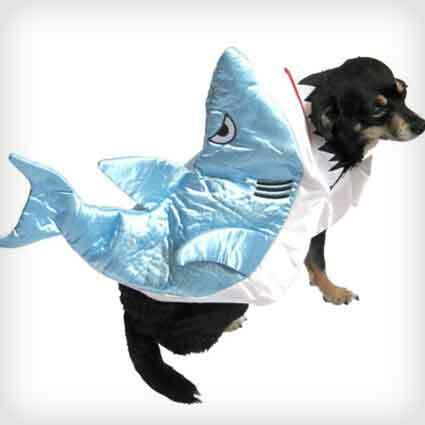 Let your dog hit the seas this Halloween with this stunning shark costume! This comfy full body costume is designed to create an illusion of a shark attack that’ll fool all your friends. Your dog will be the centre of attention when they’re seen being attacked in this costume! 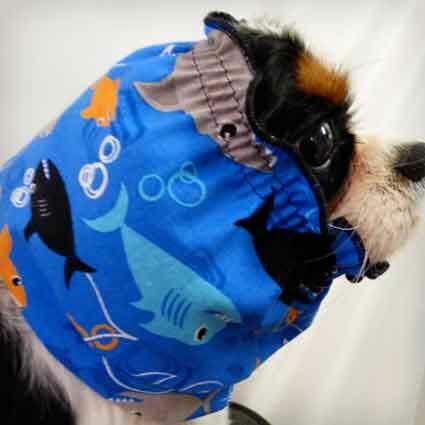 Protect your dog in style while showing your love for the king of the sea this Halloween with this superb shark snood! This cotton headpiece will keep your furry little friend warm in any part of their shark tank and show everyone that they are living the shark life! Instantly transform your furry little companion into the dangerous shark you’ve always pictured them as with this hammerhead shark costume! This costume is made from foam to help it hold a realistic shape. 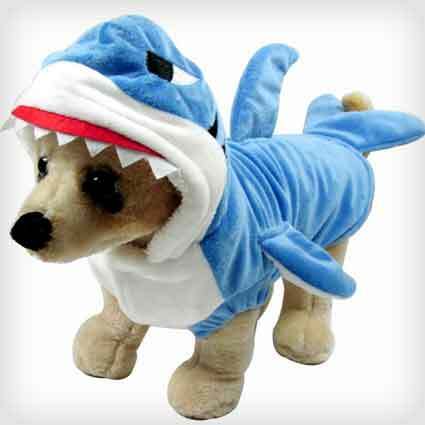 It slips onto most medium sized dogs then straps on to stay in place and to make your dog look like a real shark all night long! 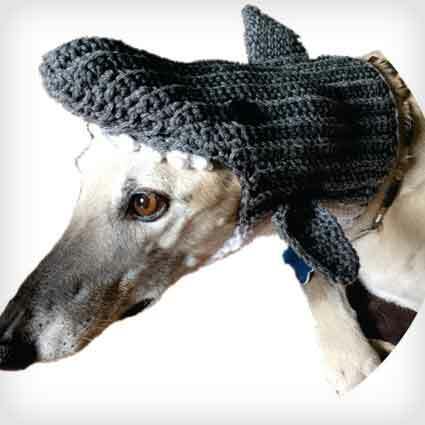 Have your dog roam free this Halloween with this stunning shark hat! This hat is handmade from yarn based on your dogs measurements for comfort and breathability making it ideal for all four-legged sharks. 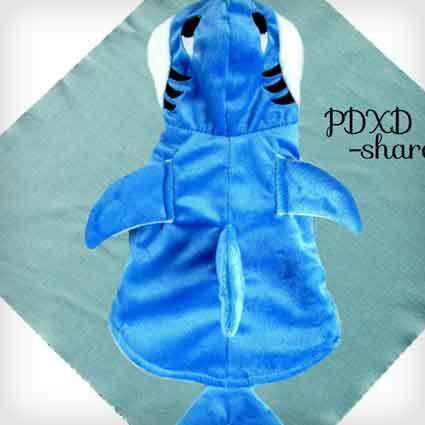 Your pooch will be the cutest shark around when they don this hat! 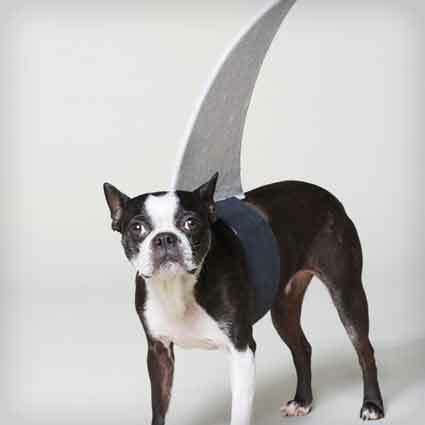 Quickly and easily turn your dog into a very realistic land shark this Halloween with this phenomenal fin costume! This lightweight fin straps onto your dogs back making it a perfect light costume that your best friend will be able to wear with comfort all night long! Let your furry friend represent their favorite ocean beast this Halloween with this incredible shark bandana! This bandana makes a perfect light yet effective costume that can be worn any day of the year making it a must have for all shark fans. 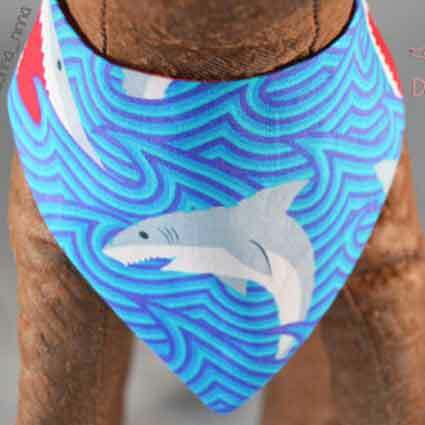 Everyone will fear the next shark attack when your pooch dons this bandana! 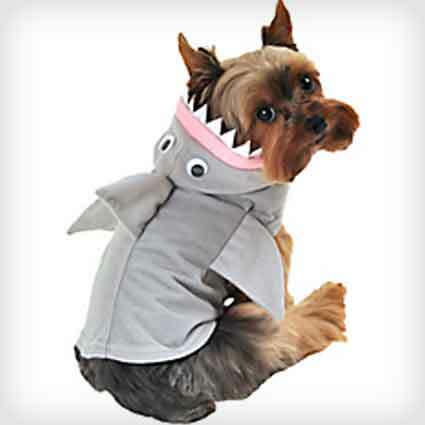 Let your pooch cause chaos this Halloween with this magnificent shark costume! This costume quickly slides over your dog and velcro straps hold it in place all night long. It also has a shimmer-texture that makes your little shark look even more realistic. Your dog will be ready for their next victim when they sport this costume! 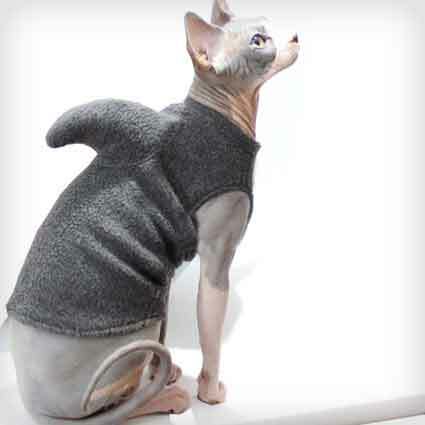 Prepare for a shark infested Halloween this year with this spectacular pet sweater costume! This costume is made from fleece so it’ll keep your little shark friend very warm all night long. 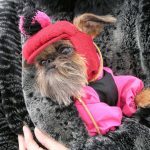 Not even the cold will be able to stop your furry little friend this Halloween! 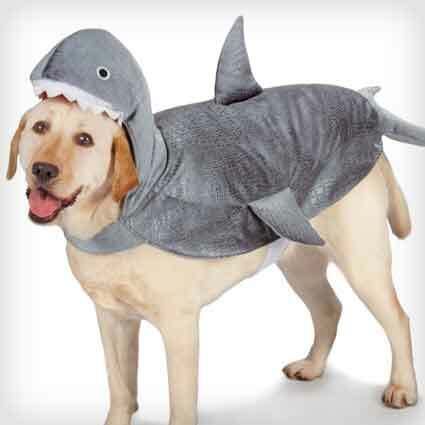 Turn your best friend into a dangerous shark this Halloween with this adorable costume! This costume is made from cotton so it is very soft and comfortable for all dogs and cats. Your furry little four-legged friend will be all set to hit the ocean and go chase their next victim when they slip into this costume! 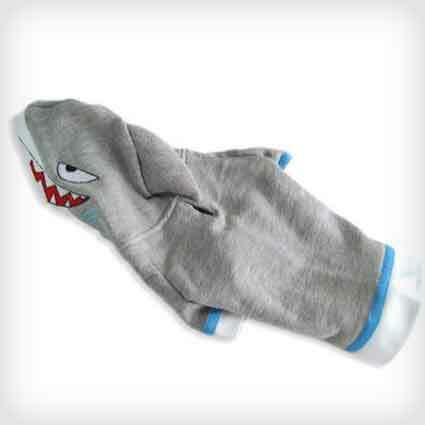 Prepare your little companion for the most comfortable shark attack ever with this adorable blanket! This crocheted shark blanket is perfect for all dogs and cats who want some extra attention this Halloween. Your little four-legged shark will be comfortable wherever they plan their next attack with this blanket! 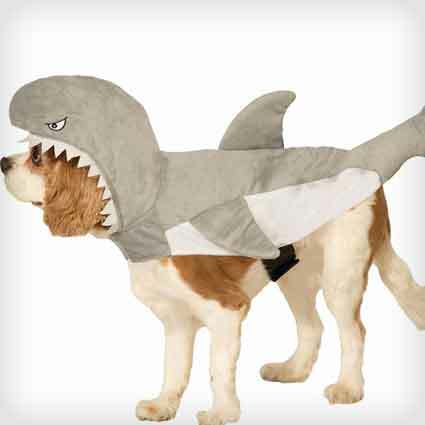 Show off your dogs bravery this Halloween with this extraordinary shark attack costume! This cozy hooded bodysuit will give the illusion that your small dog is being eaten by a real shark which will definitely catch everyones attention. 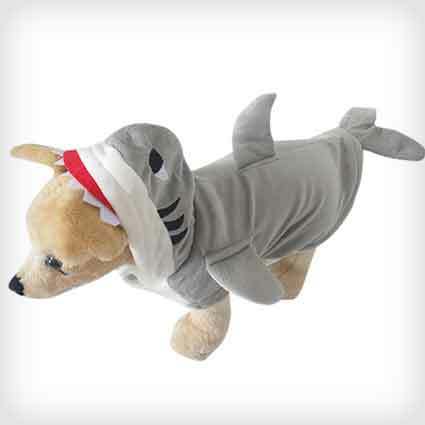 Your pooch will be the cutest shark victim in the entire ocean with this costume! 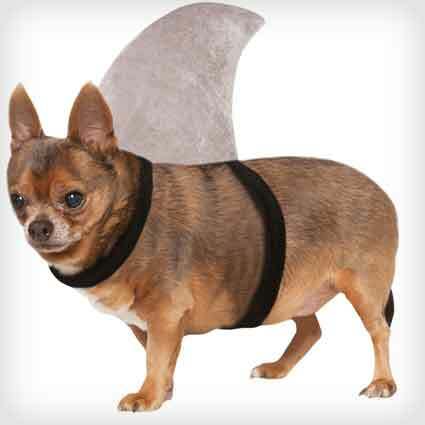 Fool all your friends into believing that your dog has transformed into a shark this Halloween with this awesome shark fin costume! This lightweight and flexible plastic fin has adjustable straps to help it fit most dogs. Your furry little friend will be ready to cause mayhem when they don this fin! 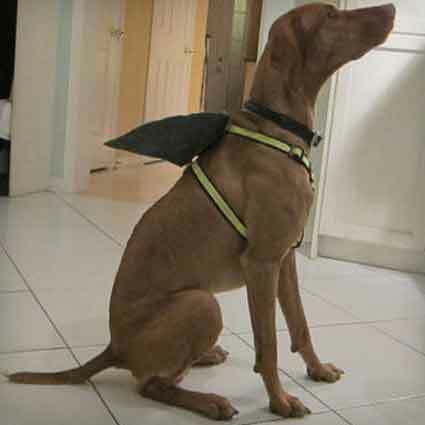 Create chaos this year by turning your four-legged friend into a dangerous shark with this outstanding fin costume! This light fin is held comfortably in place by velcro straps and adjusts to snugly fit larger dogs. 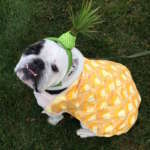 Your pooch will be ready to hit the water when you slip them into this costume! Let your furry little companion represent their desire to be swimming with the sharks this Halloween with this adorable shark bandana! This double sided bright blue bandana snaps on to stay in place all night long. 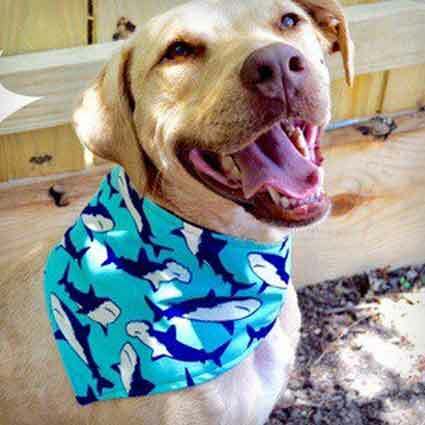 Your dog will feel like they’ve gained a new shark family with this bandana! Help your four-legged companion become the sea creature they’ve always dreamed of being with this adorable shark hoodie! This blue hoodie is great for both dogs and cats and is made from soft materials to keep your pet warm and cozy during any shark attack this Halloween! 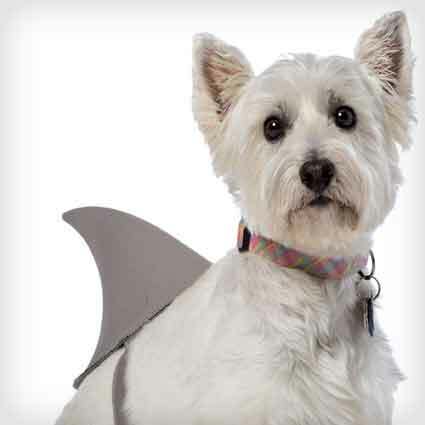 Watch out for the shark attack this Halloween when you slip your pooch into this shocking costume! This grey shark costume includes teeth and googly eyes to make your pup look as real as possible. All your friends will be amazed by your little shark in this costume! Show all your friends how dangerous your best friend is this Halloween with this adorable shark costume! 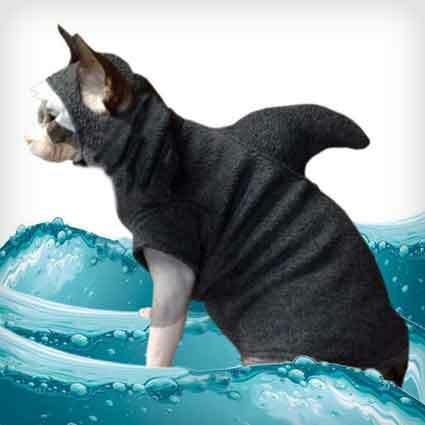 This cotton costume is designed for both cats and dogs and quickly slides on to turn them into the little shark that you’ve always wanted them to be! Let your little shark go for a swim with all their friends with this stunning bandana! This bandana has a distinct shark swarm print that will show everyone where your dog truly belongs. 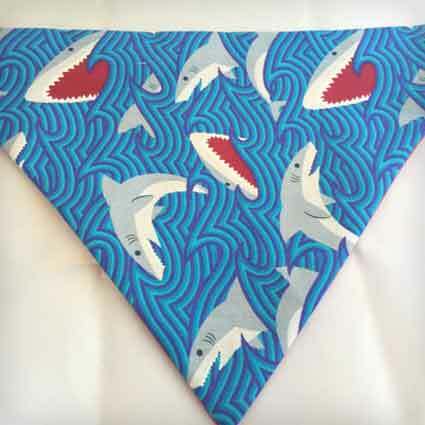 Your dog will be everyones new favorite shark when they slip on this bandana! Let your little four-legged friend swim alongside their shark friends this Halloween with this incredible shark outfit! This light blue costume has a shine that makes it stand out amongst others and will show everyone that your pooch is the best looking shark in the entire sea! 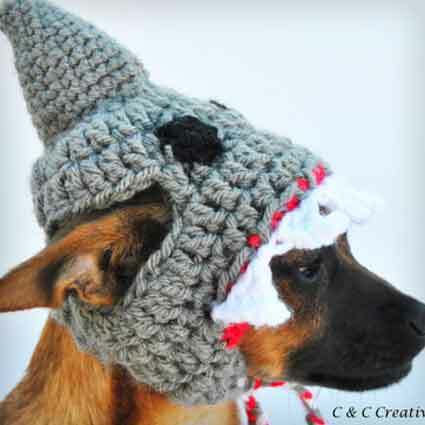 Keep your dog warm this Halloween with this cute shark hat! This fuzzy and comfy crocheted snood is handmade to order making it a must have for any dog and shark lovers. Your furry little friend will be happy living the shark life while wearing this light hat! 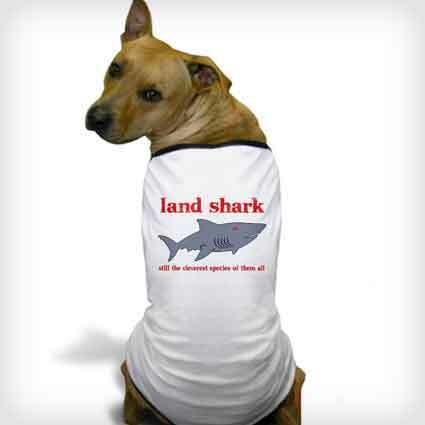 Create a land shark out of your furry little four-legged friend this Halloween with this hilarious dog shirt! This pullover shirt easily slides onto your dog to show everyone their desire to become a real land shark making this shirt a must have for all dogs who love the sea! 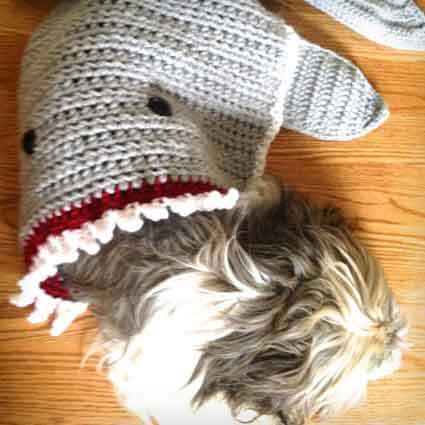 Suit up your furry little companion for a shark attack this Halloween with this handmade sweater! 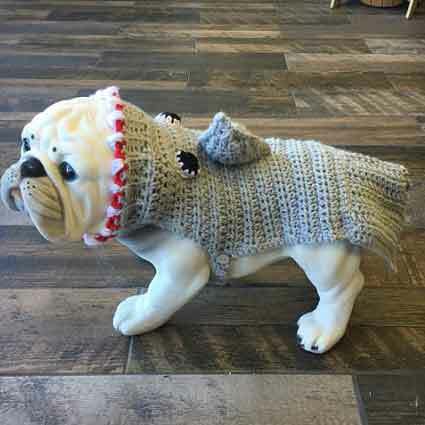 This crocheted sweater is very warm and breathable and will protect your dog or cat from the coldest shark and weather attacks this Halloween. All other sharks will be jealous of your little friend in this costume! 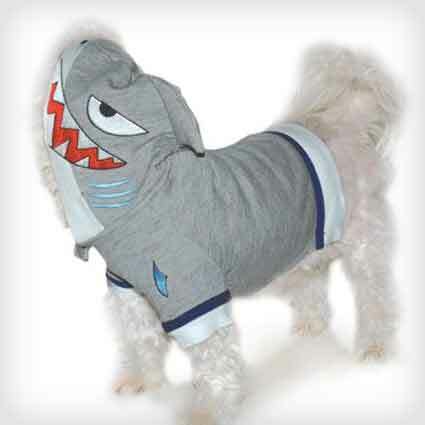 Let your pooch live as a shark this Halloween with this marvelous sweatshirt! 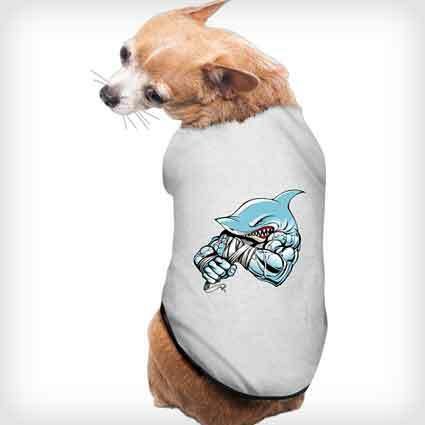 This half body pullover style shirt is very quick and easy to put on most sized dogs and the shark head and fin hood can go up to make them look like a real mini shark. 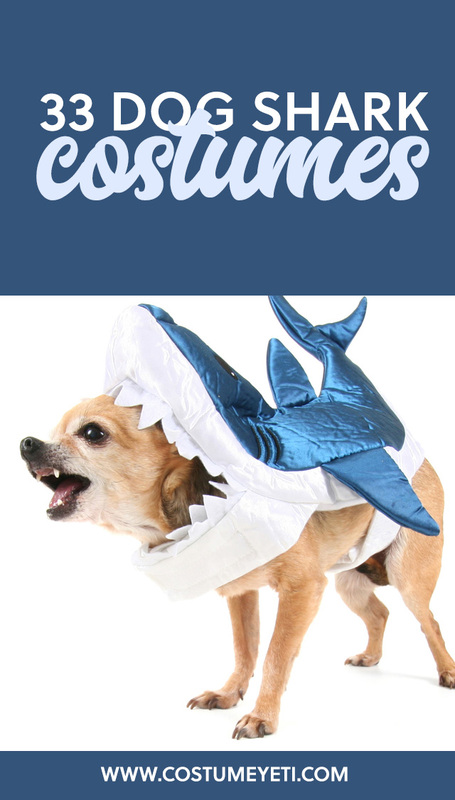 Your dog will be the most dangerous land shark when they slip into this cute costume! Prepare for an extended shark week this Halloween with this fuzzy pet sweater! 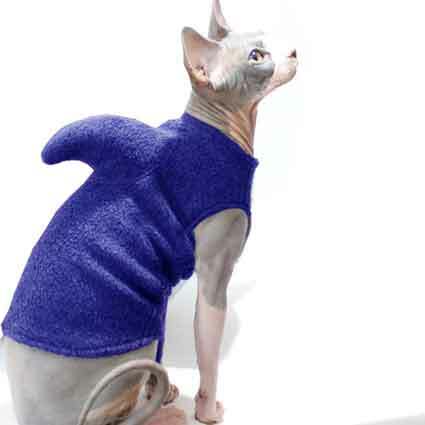 This purple soft fleece costume has a distinct fin that’ll turn both cats and dogs into cute little sharks. Your furry little four-legged friend will be prepared for whatever’s lurking at the party this Halloween! 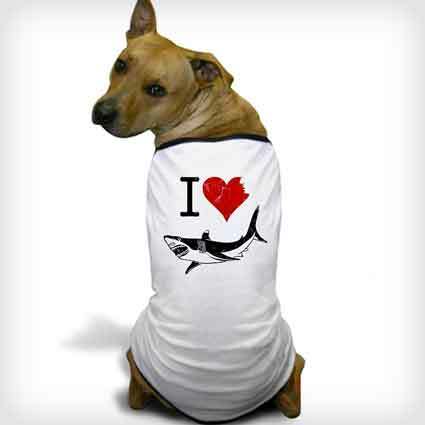 Represent your love for your favorite deep sea creature with this adorable I love sharks dog shirt! This light and soft pullover style shirt slides onto your dog to keep them comfy all night long. 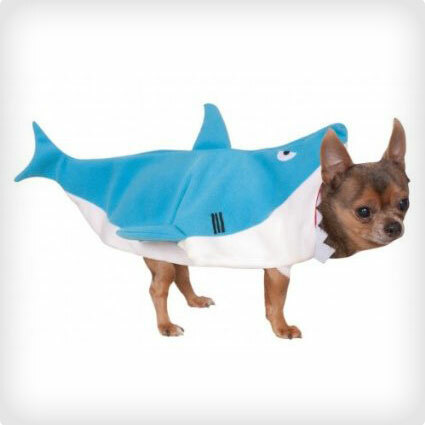 Your dog will be every sharks friend when they sport this cute costume! 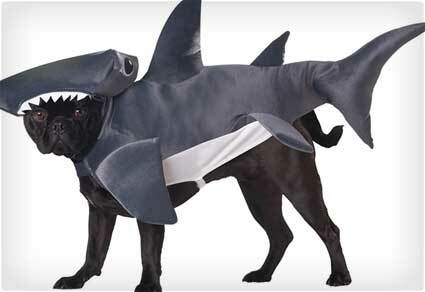 Dress your dog in style this Halloween with this award winning shark costume! This bright blue fleece and felt costume is extremely comfortable and will keep your little baby very warm while they plan their next attack. 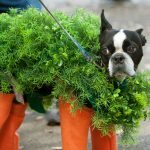 Your pooch will win everyones hearts when you slip them into this costume! 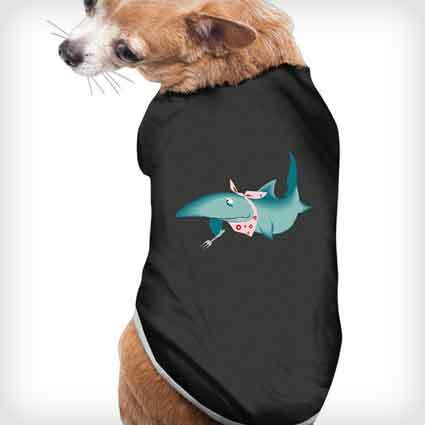 Let your furry little four-legged companion join the shark infestation this Halloween with this stunning hoodie! This pullover hoodie slips over your dog to fit snug and comfortably. 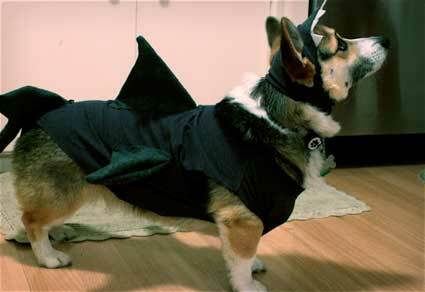 The shark face and fin on this costume will fool everyone into thinking that you’re dog really is a fish out of water! 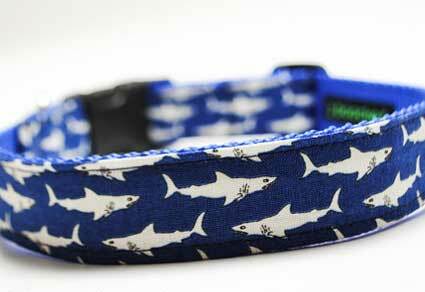 Have your pooch show their love for sharks in style with this sharp jaws collar! This collar is perfect for creating a light costume but can also be worn every day of the year making this well-designed collar a must have for all dog owners and shark fans! Show off your dogs strength this Halloween with this remarkable strong shark dog shirt! This shirt makes a great light costume for your furry friend and will prove to everyone how tough your little pooch really is. Your dog will instantly become the most ferocious predator when they sport this costume! Prepare your best friend for any attack on the beach this Halloween with this adorable shark fin costume! This half costume covers most of your dog or cat and the fin will let everyone know that your little baby is a deadly sea creature ready to hit the seas this Halloween! 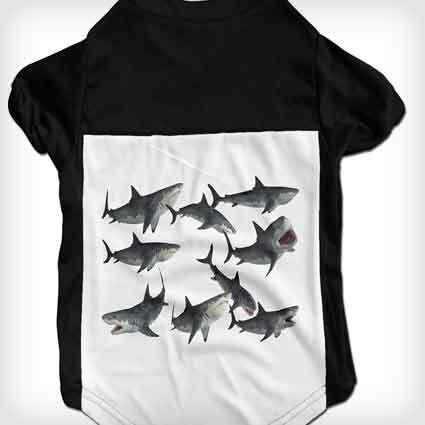 Get your little pooch prepared for their next shark meal with this fantastic shark shirt! This pullover is easy to put on all dogs and the hungry shark print will catch everyones attention. Your dog will gain extra points for originality when they don this hilarious costume! 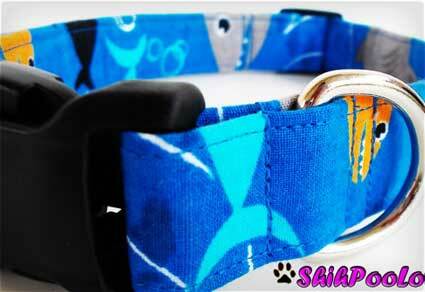 Let your pooch dive into the deep seas this Halloween with this amazing shark collar! This soft yet very durable collar that is made based on your furry little friends measurements has a very recognizable design that’ll show everyone that they’re meant to live life as the king of the ocean this Halloween! Let your furry little friend swim amongst their shark friends this Halloween with this group of sharks shirt! 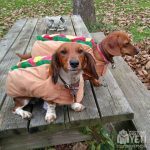 This pullover makes a quick and easy costume for most dogs and is made from a breathable fabric that’ll keep them from overheating. Everyone will be excited to meet your dog and their shark pack! 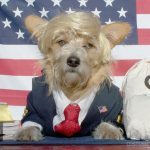 Let your dog cause chaos wherever they go for a swim this Halloween with this incredible costume guide! 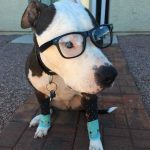 This step-by-step tutorial explains how to create a very distinct adjustable shark fin perfect for any pooch. 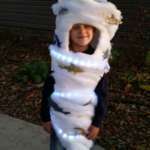 You’ll impress all your friends when you craft this costume! 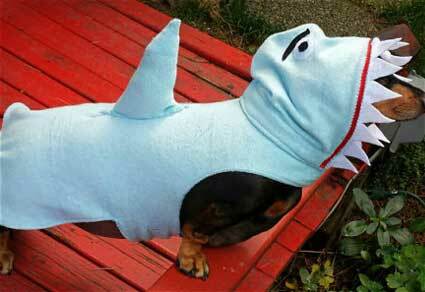 Turn your dog into a real shark this Halloween with this superb costume tutorial! Everything is laid out and lots of pictures and instructions guide you through the creation of the perfect costume. Your furry little friend will be forever thankful when you build them this stunning costume! 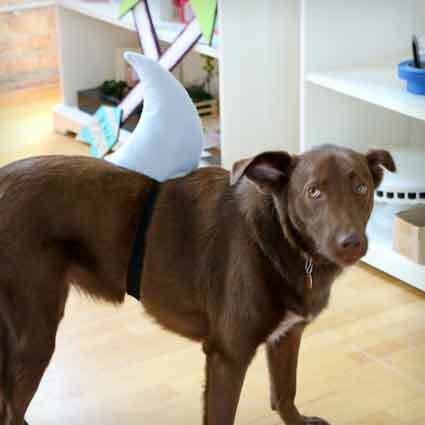 Suit up your best friend for their next shark attack with this quick and easy shark fin costume! This detailed guide shows you everything needed to create the perfect costume using a dog harness and some simple crafting materials making it very easy for anyone to complete! 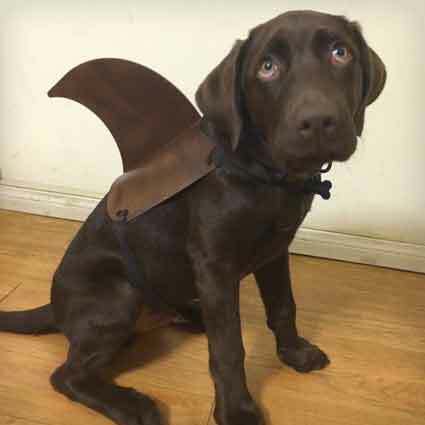 Get creative this Halloween and create a stunning shark fin for your furry little friend with this extensive costume guide! This tutorial requires a little bit of sewing that’ll pay off in the end and result in a shark fin that is unmatched. 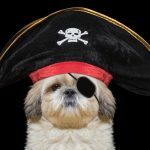 Your dog will be ready to hit the high seas when you craft this costume!